Zahra Salman Hasan, better known as Zahra AlShaikh, is a 28-year-old mother, human rights defender, and Bahraini citizen who fled her home country after enduring years of threats, harassment, imprisonment, and torture in relation to her activism. In 2012, Bahraini officers from the Special Security Force Command (SSFC) arrested Zahra during a peaceful sit-in and asked her to help arrest other activists, but she refused to cooperate. Police then held her in prison for a month and tortured her, including an instance where a female police officer forced her to remove her clothing and took photos of her on a mobile phone. In 2013, Zahra participated in another peaceful sit-in, protesting police violence and the continued occupation of Saudi Arabian forces in Bahrain. Between 15 and 18 SSFC officers in riot gear surrounded her, beat her, and removed her hijab. Bahraini authorities then charged Zahra with assaulting security officers and detained her for four months, during which they tortured her so brutally that she stated “I thought I would die.” Bahraini officers beat Zahra so viciously that she started to vomit and bled from her mouth and nose. They trampled on her stomach and legs and hit her back with batons. A judge ordered her release in mid-April 2013, however, police detained her for four more days before releasing her. Zahra later described her four-month detention as “physical and psychological torture.” In January 2014, a court found Zahra guilty of the charges and sentenced her to one year in prison. However, she was pregnant at the time of her conviction, and she was not imprisoned at this time. In October 2014, Bahraini officers in plain clothing and masks, officers from the SSFC, and officers from the National Security Agency (NSA) raided Zahra’s home without a warrant and informed her that her husband, Habib Ali Mubarak, had to surrender himself to the Criminal Investigations Directorate (CID), and they would raid the home every day until then. They assured the family that it was a “small issue” and that Habib could return immediately after the questioning. However, when Habib turned himself in, the officers disappeared him for five days, during which time they tortured him. After the five days, Habib called his wife, told her that the police were transferring him to Dry Dock Detention Center, and asked her to bring some clothes. Zahra brought Habib’s clothes, but when she arrived officers arrested her to enforce her prison sentence. Zahra had brought her six-month-old son to see his father and the officers imprisoned Zahra and her baby for eight months and forced Zahra to delete all of her previous tweets upon her release. Habib was later convicted and sentenced to 15 years in prison. In September 2018, officers raided Zahra’s home while she was taking her son to school. They left a summons for Zahra to present herself to the Office of Public Prosecution (OPP) the following day. When she arrived at the OPP, officers blindfolded her and took her to the CID. Officers interrogated Zahra for 12 hours without her lawyer present at the CID. They accused her of being part of a terrorist cell, which Zahra rebuffed, explaining that she opposes violence in every form and finds terrorism “unacceptable.” The officers also accused her of receiving money from a suspected terrorist, though Zahra explained that she had minimal contact with the individual. The officers slapped Zahra, pulled her hair, and threatened her family if she did not give them the answers they wanted. She replied that she did not have the information they were after. Officers took Zahra to the roof of the CID and recorded her apology to the King on Zahra’s phone. The officers then took her to the OPP, where authorities charged her with terrorist crimes and set her bail. Her family brought the bail money, and the officers released Zahra but kept her phone. The next day, they published the apology video on her Instagram account, which Zahra has since made private. On 24 October 2018, Zahra fled Bahrain for the United Kingdom (UK). On 13 December 2018, a Bahraini court tried and convicted Zahra in absentia for “concealing the identity of a terrorist,” sentencing her to six months’ imprisonment. Zahra is still in the UK, while Habib is still imprisoned in Jau Prison in Bahrain. Bahrain’s actions against Zahra violate international law, including the International Covenant on Civil and Political Rights (ICCPR) and the Convention against Torture and Other Cruel, Inhuman or Degrading Treatment or Punishment (CAT), both to which Bahrain has acceded. Additionally, Bahrain’s actions contravene the Bahraini Constitution, the United Nations Standard Minimum Rules for the Treatment of Prisoners (the Nelson Mandela Rules), and the Universal Declaration of Human Rights (UDHR). Zahra’s arrests for participating in peaceful sit-ins violate her right to freedom of association and expression. Furthermore, by arresting her for exercising her rights and interrogating her without her lawyer present, Bahrain arbitrarily detained her, further violating the ICCPR and the UDHR. Additionally, her torture contravenes the CAT, the Bahraini Constitution, the Nelson Mandela Rules, and the UDHR. 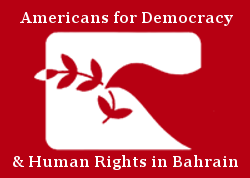 Americans for Democracy & Human Rights in Bahrain (ADHRB) calls upon Bahrain to uphold its human rights obligations by dropping Zahra’s in absentia conviction, giving Zahra a fair retrial should she return home, and honoring her right to redress and fair and adequate compensation. We additionally urge the authorities to investigate claims of torture and ill treatment by police and prison officials and to hold those officials accountable.